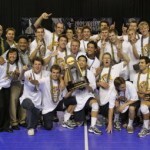 Provo, Utah – UC Irvine captured the men’s volleyball national championship with 3-2 (26-30, 30-23, 26-30, 30-17, 15-12) victory over USC at the Smith Fieldhouse in Provo, Utah Saturday afternoon. It is the second national championship in three years for the Anteaters who ended the season 27-5 overall. Senior setter Ryan Ammerman was named the tournament’s Most Outstanding Player after recording a career high 13 total blocks, 55 set assists and ties his career high with six kills. Ammerman has 12 block assists which ranks tied for third for the UCI match record books. Senior Taylor Wilson and freshman Carson Clark were named to the All-Tournament team after recording 21 and 15 kills. Sophomore Jordan DuFault added 14 kills and a team high 11 digs. USC was lead by Murphy Troy with a match-high 26 kills Tony Ciarelli and Austin Zahn each played an awesome game for the Trojans. This was a spectacular game for all the fans attending at the BYU Smith Fieldhouse. Have a favorite team that has made an impressive victory lately that we need to know about? Then leave us a comment below.